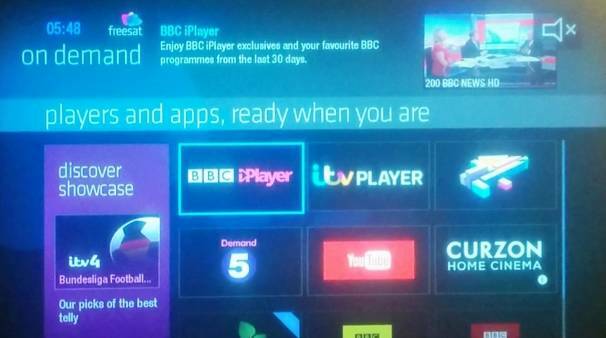 If you have a problem with your Freesat box not allowing you to get to the large selection of online TV shows, here is how to fix the problem. If you see "no internet connection" or no services listed under "On Demand", do this. If the online services have worked in the past, but not today, here's how to fix the problem. Once done the box will continue to work until the Freesat box is powered off. Step 1. Press the "Settings" button on the remote control. Use the right arrow to select "Network connection" and press "OK". Step 2 On the "Broadband connection screen"
Press OK to select "Connect automatically". Step 3 See the "Great You're connected" screen. This means everything is OK.
Everything will be fine until the box is powered off. 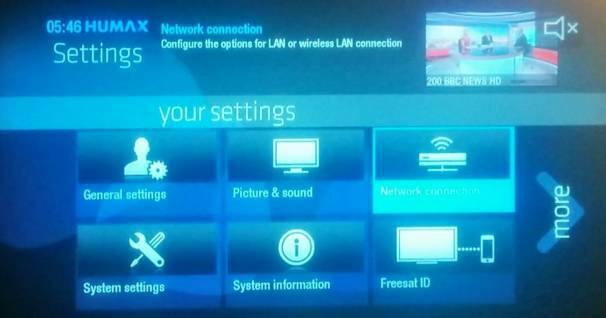 Sadly your article about regaining online content on Freesat doesn't work for a Humax RM-F01 as the Menu and settings are different. 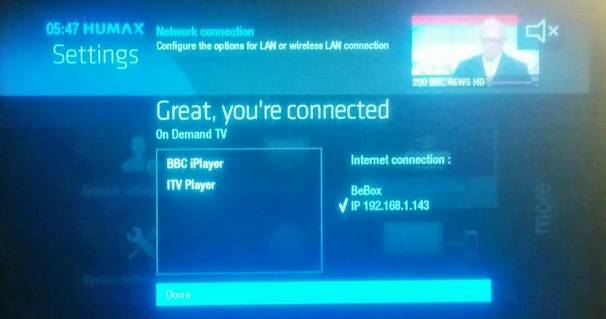 I have wifi extenders which used to work and the green lights are on but I just keep getting the message to say my box is not connected when I go to BBC Or ITV player. Any ideas? I have tried entering the settings manually but that hasn't worked either. Jennie Harrod: Briantist was requesting the actual model number of the Freesat box in question, the number you have supplied is that of the remote control. The model number of the box is printed on a small plate attached to either the rear or underside of the box. Well that's a great piece of advice except there is no settings button on the remote, you have to press the home button first to get into the menu. I have no on demand services, the strength is good and it says I am connected but still no service !!! To offer any meaningful advice/assistance we need to know what your location is. That is best done by entering your full post code, or that of a very nearby shop or public building. That will enable viewing of transmission and reception information relevanmt to you. I am receiving all the freesat channels on the menu guide. The problem is Channel 4 on demand . I cant want watch it continually. The picture goes into coloured squares after the adverts are finished. 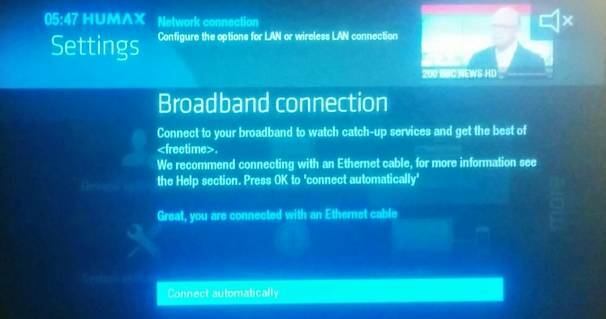 The internet connection in settings on tv states BBC iplayer and ITV on demand. We have WiFi and have backed it up with a DEVOLO dlan 1200 + wifi ac powerline to boost the internet to no avail. Contacted Freesat who said i should contact Channel 4. But to say what ! clive john valentine: If the on demand service isn't working properly, start with your system and your download speed - if its too slow it just wont work. And do you have a capped download limit? Alan Claridge: You would need a USB DVB-S2 satellite tuner such as the one at the link below, which needs to be connected to a satellite dish pointing at the 28E orbital position (you can reuse the existing dish and cabling if your property has previously had Sky). You won't receive Freesat as such, but you'll be able to receive all the free to air (FTA) channels which are available on Freesat.